Bring your family and your "Spirit of Wonder and Imagination" as you tour the historic Parlours of the Harry Packer Mansion in Jim Thorpe in true holiday style. Follow along to this beloved classic as you visit a gorgeous display inspired by a different scene from “The Nutcracker Suite” in each room. 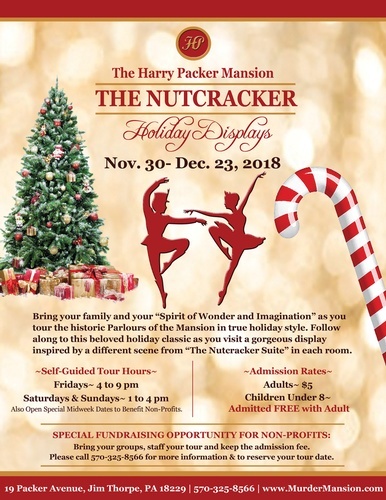 In addition to the tour, the Harry Packer Mansion’s Libation's Lounge is also featuring a special Nutcracker inspired cocktail menu. Adults can enjoy the Sugar Plum Fairy and The Nutcracker, and for the children, we have Clara and Fritz. Runs Friday, November 30th thru Sunday, December 23rd. Children Under 8 - FREE when accompanied by an Adult.